Contexte: Le noma (cancrum oris) demeure le fléau des enfants et le “visage de la pauvreté” en Afrique subsaharienne. Des données récentes sur le fardeau du noma et de ses facteurs de risque sont nécessaires pour évaluer et redéfinir les interventions en vue de sa prévention et de son contrôle. Objectifs: Cette étude visait à déterminer la structure du noma et de ses facteurs de risque dans le nord-ouest du Nigeria. Matériels et Méthodes: Il s'agissait d'une étude rétrospective qui a examiné les cas de noma (cancrum oris) admis à l'Hôpital Noma Children, Sokoto, au Nigeria, entre janvier 1999 et décembre 2011. Informations sur les bio-données des patients, le site et la sévérité des les lésions, et la présence de trismus et sa gravité ont été extraites des dossiers des patients et analysées à l'aide de statistiques descriptives. Résultats: Cent cinquante-neuf (8,3%) des 1923 patients admis à l'hôpital entre janvier 1999 et décembre 2011 ont reçu un diagnostic de noma frais. L'âge moyen des patients était de 3.0 ± 1.4 ans et la majorité d'entre eux 139 (87.4%) étaient âgés de 1 à 5 ans. La lésion des tissus mous concernait essentiellement plusieurs sites, mais le plus souvent les joues externe et interne (84.3%). Les facteurs de risque les plus fréquemment identifiés étaient la rougeole (47.2%) et la malnutrition protéino-énergétique (42.1%). Il y avait des augmentations et des chutes de la prévalence du noma dans la période étudiée. Conclusion: Cette étude a montré une forte charge de noma dans le nord-ouest du Nigeria, principalement chez les enfants âgés de 1 à 5 ans, et avec des lésions des tissus mous impliquant plusieurs sites. La rougeole et la malnutrition ont été les principaux facteurs de risque identifiés, et la tendance de la maladie a montré un profil ondulatoire. Il est urgent d'éliminer la maladie au Nigéria grâce à la prévention et au contrôle des maladies infectieuses et de la malnutrition. Noma (cancrum oris) is a devastating infectious disease that destroys the soft and hard tissues of the oral and para-oral structures; it remains the scourge of children and the “face of poverty” in Sub-Saharan Africa., While the disease has been eliminated in Europe and North America (largely through control of malnutrition and infectious diseases), its incidence continues to increase in the underdeveloped countries of Sub-Saharan Africa. These countries (extending from Senegal, through Nigeria, to Ethiopia) account for most of the annual global cases of noma (estimated at 140,000) and are referred to as the “noma belt.”, Poverty has been identified as the main driving force behind the high incidence of noma in Sub-Saharan Africa. Specifically, the major risk factors of the disease include malnutrition, poor oral hygiene, and debilitating infectious diseases such as human immune deficiency virus (HIV) infection, measles, and other childhood diseases; as infections and malnutrition are known to impair the immune system, and they have become the common denominator for the occurrence of the disease in Sub-Saharan Africa. Studies across Nigeria also show wide variations in the incidence of noma, ranging from 3 to 45 cases over a period of 10–14 years., Reports from previous studies showed that Northwestern Nigeria had the highest burden of noma in the country, with an estimated incidence of 6.4/1000 children, which was far above the estimated 1: 1250 incidence of noma in Nigeria. Although mortality from noma has reduced drastically from 70% to 90% in untreated cases, to 8%–10% in those treated with modern antibiotics and better nutrition,, of serious concern is the fact that the survivors of the disease are left with unsightly facial disfigurement, intense scarring, trismus, oral incompetence, and social alienation. In addition, the orofacial mutilation and functional impairment that follow the disease require a time-consuming and financially prohibitive surgical reconstruction that the poor survivors of the disease could not have been able to afford if not for the free services provided through majorly donor-funded projects. There is a dearth of data on the burden of noma and its risk factors. Recent data are needed for evaluating the impact of ongoing interventions, and for designing appropriate strategies for the prevention control of the disease by targeting its risk factors. This study aimed to determine the pattern of noma and its risk factors in Northwestern Nigeria. This was a retrospective study based on data extracted from the case files of noma (cancrum oris) patients admitted into the Noma Children Hospital, Sokoto, Northwestern Nigeria, between January 1999 and December 2011. The case files of all the patients that presented at the hospital with fresh noma (cancrum oris) in the period under review were retrieved, and a pro forma was used to extract information on patient's biodata, the illnesses suffered by them prior to, or at presentation, the site and severity of lesion, and presence of trismus and its severity. A confirmed fresh noma case was defined as any person with a gangrenous disease which starts as gingival ulceration and spreads rapidly through the tissues of the mouth and face, destroying the soft and hard tissues. The nose, outer lining, inner lining, trismus, upper lip, lower lip, and particularities classification was used to assess and grade the severity of tissue loss and trismus. Loss of 25%, 50%, 75%, and 100% of the soft tissues in the affected sites was graded as mild, moderate, severe, and very severe tissue loss, respectively. Furthermore, mouth opening (i.e., inter-incisor distance) <4 cm, <3 cm, <2 cm, and <1 cm were graded as mild, moderate, severe, and complete trismus, respectively. Data were analyzed using the IBM Statistical Package for the Social Sciences (SPSS) version 20 computer statistical software package (SPSS, IBM Corp, Armonk, NY, USA), and the results were presented as frequency distribution tables and charts. Ethical approval was obtained from the Sokoto State Ethical Committee, and permission to conduct the study was obtained from the management of the hospital. One hundred and fifty-nine (8.3%) of the 1923 patients admitted into the hospital from January 1999 to December 2011 had fresh noma (with or without the complications of the disease). The ages of the patients ranged from 1 to 32 years (mean = 3.0 ± 1.4), but majority of them, 139 (87.4%) were aged 1–5 years and were females (55.3%) as shown in [Table 1]. 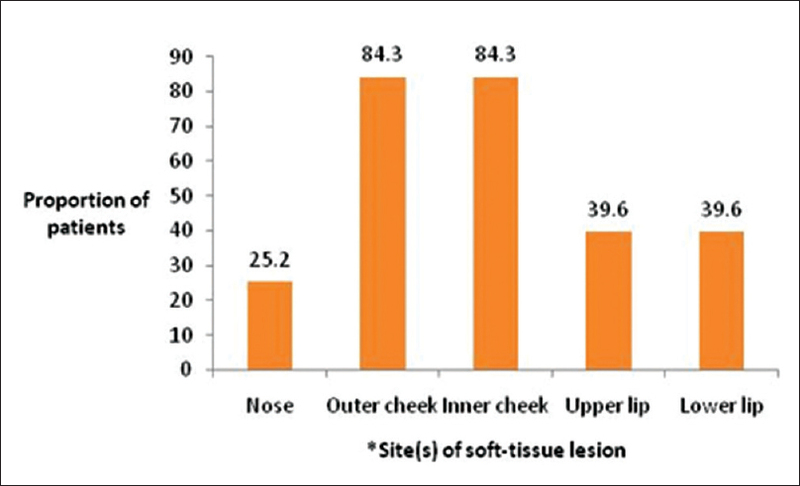 The soft-tissue lesions mostly involved multiple sites, the outer and inner cheeks were affected in most 134 (84.3%) of the 159 patients, followed by the upper lip and lower lips 63 (39.6%), while the nose was the least affected area 40 (25.2%) as shown in [Figure 1]. The lesions were majorly of moderate severity in all the affected sites, but the proportion of patients with very severe lesions (i.e., total tissue loss) was higher with nasal involvement (10%) as compared to involvement of other sites (ranged from 3.2%–6.3%) as shown in [Table 2]. Only 12 (7.6%) of the 159 patients presented with palatal and osseous defects; of these, 4 (33.3%) had loss of Lt maxilla, 3 (25.0%) had loss of Rt maxilla, while another 3 (25.0%) had loss of both maxillae. Furthermore, 1 (8.3%) each had loss of Lt and Rt mandible [Table 3]. Only 24 (15.1%) of the 159 patients presented with trismus; of these, a larger proportion 9 (37.5%) had severe trismus, followed by those with complete trismus 7 (29.1%), only 4 each (16.7%) had mild and moderate trismus [Table 4]. Only 11 (6.9%) of the 159 patients had no concurrent illness or history of illness in the 3 months preceding their presentation at the hospital, the remaining 148 (93.1%) had one concurrent disease or the other at presentation or in the 3 months preceding their presentation with fresh noma at the hospital; and the most common diseases they also presented with or have had were measles (47.2%) and protein-energy malnutrition (42.1%) as shown in [Table 5]. The trend of the disease showed a wave-like pattern; while the proportion of cases rose from 8 (5.0%) in 1999 to 22 (13.8%) in 2001, it declined sharply by almost half to 11 (6.9%) in 2002, only to rise to 20 (12,5%) in 2003. Furthermore, it dropped slightly to 15 (9.4%) in 2006, and thereafter dropped completely to 0 (0%) in 2009, after which it rose again to 15 (9.4%) in 2011 as shown in [Figure 2]. The high burden of noma in this study, 159 (8.3%) of 1923 patients, compares well with the finding in a study conducted at the University College Hospital, Ibadan, Southwestern Nigeria, that also reported high burden (173 cases) of noma. The underlying factor in the similarity in the burden of noma in the two studies could be poverty, which has been identified as the single most important cause of noma in Africa. The Nigeria Poverty Profile 2010 report, indicated that Northwestern Nigeria (the study area) had the highest absolute poverty level in Nigeria; the fact that the cases seen at Ibadan were majorly those from poor households suggest that the children in this study and the Ibadan study were most likely comparably exposed to the risk factors of the disease, particularly malnutrition and infectious diseases. It is not surprising that the findings in this study and the Ibadan study differ from the finding in another study conducted at the Maxillofacial Unit of the University of Nigeria Teaching Hospital, Enugu, Nigeria, that reported only 3 patients (two boys aged 5 and 14 and one woman aged 28) over a 10-year period, and the very low prevalence of noma obtained in the study was attributed to the nutritional culture of balanced diet in the study area. The findings in these studies corroborate the findings in a study by Enwonwu et al. that established a confounding interaction between malnutrition and infection in the pathogenesis of noma in Africa. The dominant role of malnutrition in the pathogenesis of noma is further supported by the dramatic response to antibiotic treatment and optimized treatment of acute malnutrition (using locally prepared starter and catch-up feeds) in a 2-year-old African girl with fresh noma, in which there was remarkable evolution of wound within 1 week and wound healing within 2 weeks. Most of the patients in this study (87.4%) were aged 1–5 years, with a mean age of 3 ± 1.4 years, and a majority of them (55.3%) were female. This finding is in consonance with the finding in a study conducted in Bobo-Dioulasso, Burkina Faso, where most of the patients (81%) were in the 1–5 years age group and a majority of them (58%) were females. In contrast to the finding in this study, another study conducted among patients with human immunodeficiency virus infection and acquired immunodeficiency syndrome (HIV and AIDS) in Zimbabwe reported a mean age of 14.2 years, but a majority of the patients (64.6%) in the study were also female. The predominantly young population of the patients in this study is in agreement with the established epidemiology of the disease, as noma is known to affect mostly children between 3 and 12 years of age. This is further supported by the established temporal relationship between the occurrence of fresh noma and the timing of linear growth in Nigerian children. The occurrence of fresh noma is believed to be programmed very early in life by malnutrition and chronic infection resulting from replacement of breast milk with contaminated inferior substitutes. It was also speculated that children with fresh noma might also be victims of intrauterine growth retardation, as noma is most prevalent during the infantile phase of child growth which starts at midgestation and tails off at 4 years. The soft-tissue lesions in the patients in this study involved multiple sites, but the outer and inner cheeks were affected in most 134 (84.3%) of the 159 patients. Similar to the finding in this study, isolated cheek defect was also the most common defect in a study among patients with HIV/AIDS in Zimbabwe, even though a much lower proportion of patients (37.5%) were involved. Whereas, the mortality from noma has reduced from 70% to 90% in those not properly treated to 8%–10% with the use of modern antibiotics and better nutrition, of serious concern is the orofacial mutilation and functional impairment which require a time-consuming, and financially prohibitive surgical reconstruction in survivors of the disease, and they underscore the need to prevent and control the disease through provision of an economic climate that allows even the poorest to feed their children sufficiently. This is believed to have contributed immensely to the elimination of the disease in the Western world. The most common risk factors of noma among the patients in this study were measles (47.2%) and malnutrition (42.1%). The findings in this study compare well with the findings in another study by Baratti-Mayer et al., in which the independent risk factors associated with noma were severe stunting or wasting, high number of previous pregnancies in the mother, and the presence of respiratory disease, diarrhea, or fever in the past 3 months. Debilitating infectious diseases including measles are considered to be precursors to noma, and measles is believed to be an important risk factor because of the immunosuppression, it causes in those affected. This probably explains why noma often starts as an ulcer on the oral mucosa commonly after a bout of measles or other diseases. The high burden of noma in this study correlates perfectly with the high prevalence of its risk factors (particularly malnutrition and measles) among the patients; and while it also correlates perfectly with the high prevalence of malnutrition in the study area (Northwestern Nigeria), it could be related to the abysmally low compliance with full immunization of under-five-year-old children in the zone. According to the Nigeria Demographic and Health Survey 2013 report, 37%, 18%, and 29% of under-five-year-old children in Nigeria were stunted, wasted, and underweight, respectively, and the prevalence of wasting was highest in Northwestern Nigeria (27%). Similarly, only 25% of children aged 12–23 months had full immunization for the vaccine-preventable childhood diseases in Nigeria, and the prevalence was lowest in Northwestern Nigeria (9.6%). 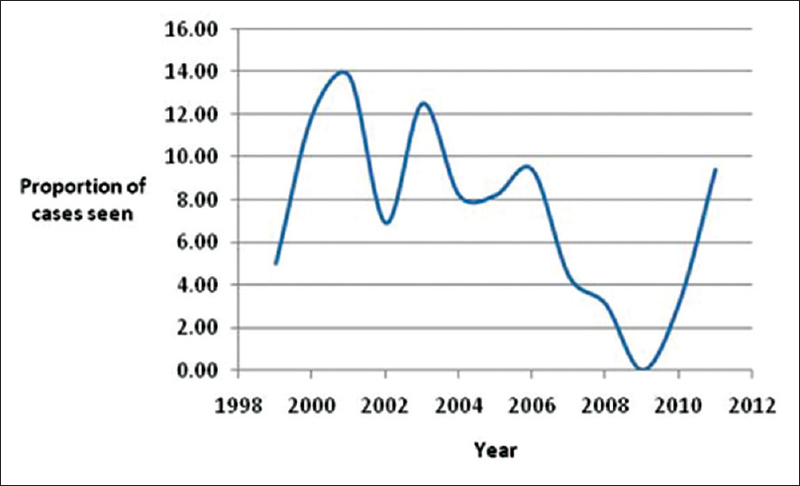 In contrast to the consistent decline at five-yearly intervals in the proportion of children with noma in a study conducted in Ibadan, Nigeria, the trend of noma in this study showed a wavelike pattern with increases alternating with decreases. The highest proportion of fresh noma cases 22 (13.8%) was seen in 2001. This could be due to the intense case finding conducted by the outreach team of the hospital at that time, and it was also a time of economic hardship in the country. The finding in this study is similar to the finding in another study conducted in Ile-Ife, Southwestern Nigeria, where the highest proportion of acute cancrum oris cases was seen during the period of structural adjustment program which affected the socioeconomic status and the nutritional condition of the children. The drop in prevalence to zero in 2009 could be due to a reduction in surveillance activities rather than an absence of the condition in the community. The wavelike pattern of the trend of noma in this study perfectly mirrored that of other infectious diseases in Nigeria, and it could be a reflection of the inconsistencies in the disease surveillance and reporting in Nigeria.,, Worse of all, noma is a neglected tropical disease (NTD), that is, also largely neglected even in the tropical countries where it is endemic; despite the high burden of noma in Nigeria and the horrific facial disfigurement and functional impairment in survivors of the disease, it is not among the priority diseases of public health importance in Nigeria. Although disease surveillance and response are crucial to elimination of NTDs, resource-constrained countries which carry the heaviest NTDs' burden face various challenges on how to strengthen the health system as well as develop effective and novel tools for surveillance and response tailored to local settings. There is therefore an urgent need to include noma in the list of diseases targeted for elimination in the country, and concerted efforts should be made to prevent and control the risk factors of the disease, including infectious diseases and malnutrition. A major drawback of a single center (hospital)-based study is the believe that the data would not be sufficiently representative of the community, in contrast, to the data obtained from all the hospitals serving a community and which can be related to a geographically defined community population. This is not a limitation in this study as the study center is the only hospital designated for managing noma cases in Northwestern Nigeria. Although the period covered by the study is about 7 years ago, the findings of the study are still applicable today in view of the fact that the burden of the main risk factors of the disease (particularly poverty, malnutrition, and high prevalence of infectious diseases) still remains as high as it was during the period covered by the study. This study showed high burden of noma in Northwestern Nigeria, and the disease was predominantly among children aged 1–5 years. The soft-tissue lesions involved multiple sites, but most commonly the outer and inner cheeks. Measles and malnutrition were the major risk factors identified, and the disease trend showed an unstable pattern. There is an urgent need to eliminate the disease in Nigeria through prevention and control of its risk factors, particularly infectious diseases and malnutrition. The authors appreciate the management of Noma Children Hospital, Sokoto, Nigeria, for the permission given to conduct the study. Marck KW, Spijkervet FK. Noma: 'the face of poverty'. Ned Tijdschr Tandheelkd 2001;108:496-9. Ashok N, Tarakji B, Darwish S, Rodrigues JC, Altamimi MA. A review on noma: A recent update. Glob J Health Sci 2015;8:53-9. Ogbureke KU, Ogbureke EI. NOMA: A preventable “scourge” of African children. Open Dent J 2010;4:201-6. Enwonwu CO, Falkler WA, Idigbe EO. Oro-facial gangrene (noma/cancrum oris): Pathogenetic mechanisms. Crit Rev Oral Biol Med 2000;11:159-71. Baratti-Mayer D, Gayet-Ageron A, Hugonnet S, François P, Pittet-Cuenod B, Huyghe A, et al. Risk factors for noma disease: A 6-year, prospective, matched case-control study in Niger. Lancet Glob Health 2013;1:e87-96. Feller L, Altini M, Chandran R, Khammissa RA, Masipa JN, Mohamed A, et al. Noma (cancrum oris) in the South African context. J Oral Pathol Med 2014;43:1-6. Chidzonga MM, Mahomva L. Noma (cancrum oris) in human immunodeficiency virus infection and acquired immunodeficiency syndrome (HIV and AIDS): Clinical experience in Zimbabwe. J Oral Maxillofac Surg 2008;66:475-85. Fieger A, Marck KW, Busch R, Schmidt A. An estimation of the incidence of noma in North-West Nigeria. Trop Med Int Health 2003;8:402-7. Nigeria Centre for Disease Control. Technical Guideline for Integrated Disease Surveillance and Response in Nigeria. Abuja, Nigeria: NCDC; 2013. http://www.ncdc.gov.ng/themes/common/docs/protocols/4_1476085948.pdf. [Last accessed on 2018 Apr 18]. Marck KW, Bruijn HP, de Schmid F, Meixner J, van Wijhe M, van Poppelen RH, Noma: The Sokoto approach. European J Plastic Surg 1998;21:277-81. Obiechina AE, Arotiba JT, Fasola AO. Cancrum oris (noma): Level of education and occupation of parents of affected children in Nigeria. Odontostomatol Trop 2000;23:11-4. National Bureau of Statistics (NBS). Nigeria Poverty Profile 2010. Abuja, Nigeria: NBS; 2012. Available from: https://www.nigerianstat.gov.ng/pdfuploads/. [Last accessed on 2018 Apr 18]. Weledji EP, Njong S. Cancrum oris (Noma): The role of nutrition in management. J Am Coll Clin Wound Spec 2015;7:50-2. Tall F, Ki-Zerbo G, Ouedraogo I, Guigma Y. Noma in children in a hospital environment in Bobo-Dioulasso: Epidemiologic, clinical and management aspects. Odontostomatol Trop 2001;24:21-5. Enwonwu CO, Phillips RS, Ferrell CD. Temporal relationship between the occurrence of fresh noma and the timing of linear growth retardation in Nigerian children. Trop Med Int Health 2005;10:65-73. National population commission (NPC) [Nigeria] and ICF international. Nigeria Demographic and Health Survey 2013. Abuja, Nigeria, and Rockville, Maryland, USA: NPC and ICF International; 2013. Denloye OO, Aderinokun GA, Lawoyin JO, Bankole OO. Reviewing trends in the incidence of cancrum oris in Ibadan, Nigeria. West Afr J Med 2003;22:26-9. Federal Ministry of Health (FMoH). National Policy on Integrated Disease Surveillance and Response (IDSR). Abuja, Nigeria: FMoH; 2005. Dairo MD, Bamidele JO, Adebimpe WO. Disease surveillance and reporting in two Southwestern States in Nigeria: Logistic challenges and prospects. J Public Health Epidemiol 2010;2:126-9. Abubakar AA, Sambo MN, Idris SH, Sabitu K, Nguku P. Assessment of integrated disease surveillance and response strategy implementation in selected local Government Areas of Kaduna state. Ann Niger Med 2013;17:14-9. Zhou XN, Bergquist R, Tanner M. Elimination of tropical diseases through surveillance sand response. Infect Dis of Poverty 2013;2:1. Masi AT. Potential uses and limitations of hospital data in epidemiologic research. Am J Public Health Nations Health 1965;55:658-67.